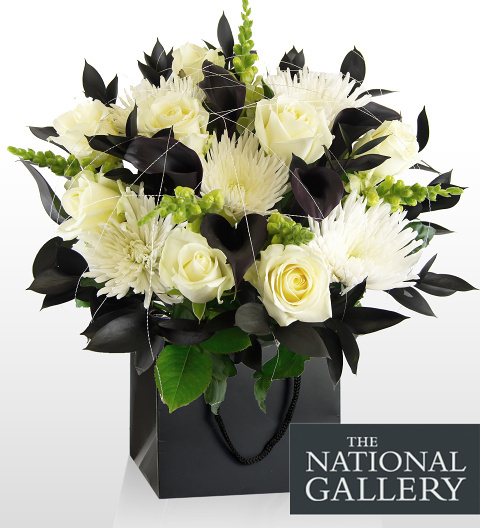 For a limited time only we are pleased to introduce to our National Gallery range of bouquets &apos;The Monochrome&apos;. Inspired by the National Gallery exhibition Monochrome: Painting in Black and White, the theme of this bouquet is taken from painting using predominantly black-and-white shades that has long held a fascination for artists. With Dutch avalanche roses, white stocks, black Calla lilies with chrome wire, the bouquet makes a grand statement. Send s bouquet with a difference this Christmas with the very special festive arrangement.